Carriage clocks are always sought after, especially those carriage clocks by the well-known Paris makers of the Victorian period such as Henri Jacot, Alfred Drocourt, Margaine, Le Roy, amongst other top carriage clock makers. Not only are buyers keen on the classic carriage clock case shapes, such as the Corniche, the Anglaise (devised especially for the English market) and the desirable Gorge style, but also the more intricate carriage clock cases; such as those with engraving to the cases, decorative mouldings and painted porcelain panels rather than the usual glass. 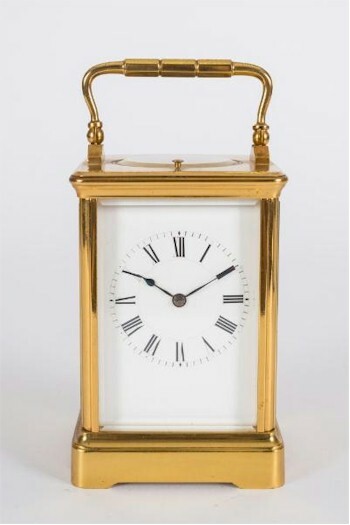 A Gilt-Brass Carriage Clock by Henri Jacot of Paris (FS24/719). Escapements are the heartbeat of a clock and the poorer carriage clock tended to employ the lesser cylinder escapement whilst the better carriage clocks were fitted with a lever escapement, although there were some variations, including the use of the duplex escapement. The highest prices are achieved for those rarer carriage clock examples made in England by Frodsham, Dent, James McCabe, H White and others, but beware of some carriage clocks bearing these signatures that are actually of Paris manufacture and only retailed by these names. Although still of high quality, they will not command the premium of an English-made carriage clock. Higher prices are also achieved for those carriage clocks with unusual striking, the norm being one that strikes the hours on a bell or a gong, with more complex examples being those with petite-sonnerie, which will also strike the quarters on two bells or gongs; and grande-sonnerie strikework, striking both the quarter hour and the hour at each quarter.